Summer is a great time to buy Michigan grown produce at your local Farmers Market. These products are fresh, inexpensive and support our local farmers. The number of Farmers Markets have tripled in Michigan during the past decade, helping our economy grow. There are markets in many communities including Gaylord, Hillman and the well-known Eastern Market in Metro-Detroit. 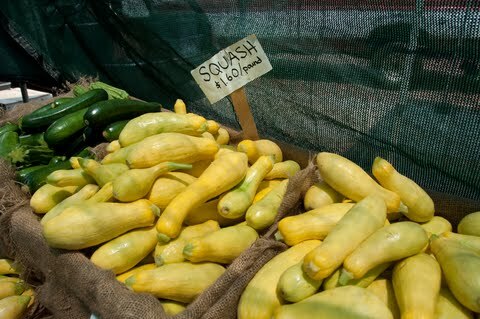 Visit this site to search for local Farmers Markets in your area. Rick Schalkofski, at our Hillman Branch, was a professional cook for ten years before joining Community Financial Credit Union. Rick finds the best ingredients often come from local farmers. Click here for a recipe on spaghetti squash. Farmers Markets in the Hillman area are a part of the region’s effort to build sustainable communities, where business are focused on keeping money local in the local economy. Buying locally helps support your community, and banking locally does too. Unlike banks that profit from your money, Community Financial Credit Union is a not-for-profit institution. Community Financial gives back to our members through savings and low rates, and also to our community by sponsoring and donating to local programs. Learn more about what Community Financial Credit Union can do for you by visiting one of our eight Michigan locations. To learn more about the differences between a bank and a credit union, visit our previous post.